Do you need to accelerate your IT and back office cost reduction programmes? Perhaps the following issues are familiar to you? In response to 'credit crunch', you now need to make significant cost reductions in your IT and back office costs. Your current initiatives will not deliver significant savings within the aggressive timescales that you need to work to. You've invested significant resources in Lean and Six Sigma initiatives, they had some good results initially, but now you are bogged down and struggling to deliver meaningful results. You've outsourced significant operations and enjoyed significant cost reductions. However, service quality is now an issue and it's difficult to make changes without incurring significant 'change request' charges. You have offshored key IT and service support operations. The processes worked fine as originally defined. However, you are now faced with requests for significant headcount increases offshore to make up for operational efficiency and service quality problems. Your current cost reduction strategy for IT and back office operations is dependent on making further large-scale investments in IT. Your CFO is concerned that this approach requires too much capital expenditure, is too high risk and the benefits are too far off. Are you wondering how you can transform your situation to get back on track? How can you transform this difficult situation? Would you try and eat soup with a steak knife? Of course not. However, in our experience the strategies and techniques being most frequently applied to improve operational effectiveness in IT and back office operations within financial institutions just don't work. 'Lean' and 'Six Sigma' techniques have delivered incredible results in many automotive and other manufacturing businesses. However, they are not well suited to IT and service processes. Typically, financial institutions deploying Lean and Six Sigma based approaches are able to harvest the 'low-hanging fruit' but then struggle to make any further meaningful productivity improvements regardless of the number of 'master black belts' they deploy. Research proves that strategic projects are most at risk from issues that can be readily resolved. Such issues include inadequate resourcing, deploying appropriate process management and project execution disciplines, difficulties in scope and requirements management and most challenging of all successful stakeholder management (see 'Turning Great Strategy into Great Performance' by M. Mankins & R. Steele, Harvard Business Review, July 2005). Delivering significant productivity improvements to IT and back office operations successfully doesn’t have to be over complicated. Nor does it have to be a struggle. Actually, in most cases, simpler approaches are the ones most frequently overlooked. But these are the only ones most likely to work. Of course, a simple approach is only simple when you know the right questions to ask and you know what to do with the answers. And, the path is a lot more enjoyable when you can see progress right away. Sounds impossible? It’s not. If it's 'straightforward' to put things right, then why haven't you done so already? Delivering strategic projects within back office and IT operations is a difficult, high-risk endeavour. Everyone knows that the capability to translate 'strategy' into 'execution' is critical to business performance, but that doesn’t make it easy. Far from it. The failure rate on strategic projects can run as high as 60-80% (see the Working Council for CFOs at www.executiveboard.com). Many financial institutions turn to large, global technology firms for advice in how to reduce technology costs. It shouldn't be surprising that they frequently advise you to undertake large-scale complex IT programmes requiring significant investments on your part. Alternative strategies that emphasise simpler, lower cost approaches that still deliver significant cost reductions can often be overlooked. Banks are a lot more complicated than car assembly plants. Strategies, tools and techniques that work in car plants may not work as well in financial services. Complex regulatory and compliance obligations, 'invisible' products and services rather than physical products and dependency on large-scale IT legacy systems all combine to make delivering meaningful productivity and cost reduction in financial services supreme challenges. You can increase IT & back office productivity significantly whilst improving service. To transform your situation successfully means you need to focus on the 'vital few' critical interventions that will make a difference. 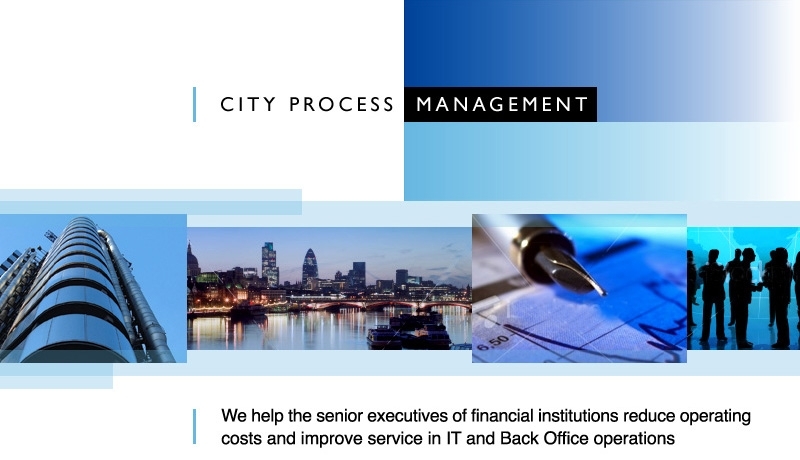 Having the necessary IT, back office process and specialist financial services business expertise enables us to get to the bottom of critical issues for you and then help you get what needs to be done resolved quickly. The primary cost driver in service processes is complexity. We help you apply powerful tools that help you eliminate complexity from your service processes and eliminate the root causes of much of the non-value added work within your service processes. Typically 50-70% of activities and costs related to service processes are 'non-value-added'. We help you focus your service processes on delivering high customer value-added activities and eliminate non-value added activities. Bottom-line, you can expect a 10-15% reduction in your overall spending on IT and back office operations. We specialise in working with the senior executives of leading financial institutions who need to overcome difficult situations. We've worked closely with leaders of some of the world's most successful financial institutions including AXA, Barclays, Capital One, Citicorp and Nationwide Building Society. Reduced IT shared services costs by 25%. Improved productivity and service quality from 'offshore' operations dramatically. Reduced operating costs in Call Centre operations by 15-25%. Accelerated critical infrastructure implementations required to be in place for major business initiatives. Implemented large-scale IT programmes to replace the core systems infrastructure supporting millions of customers. You can learn more on how we've helped clients succeed by reading our case studies by CLICKING HERE. We've helped leading business leaders achieve remarkable results. Perhaps the best way to judge the contribution that we can make to your success is to hear directly from our clients describing how we've helped them be successful. Helping deliver critical IT and business projects that enabled Andy Homer to turning around AXA UK from losses of over £100 million to profitability. Implementing strategic projects to reduce operating costs significantly and improve customer service that helped Philip Rowley transform AOL Europe from losses of over $600 million into profitability. Helping Joe Ripp improve business operations in his US and European businesses and his offshore operations in India that made a vital business contribution to the performance improvements that merited the increase of specialist outsourcer Dendrite International's share price from $8 to $16 within a year. You can hear and learn from these senior executives as they personally discuss the situation, key issues and challenges they faced and the success they enjoyed by CLICKING HERE. You might well be wondering whether we can help you with your particular situation. The following section, IS THIS YOU?, might help you to determine that we possibly can.